It takes a certain amount of time and effort to make tamales, so most people make a large batch at once -- and since tamales freeze well, this is a good idea. If you find yourself with leftover tamales, they are quite delicious when breaded and fried. They get nice and crispy on the outside and soft on the inside. 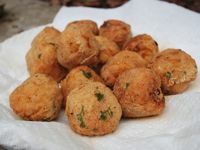 You can fry them whole or mix several tamales together and shape the masa into smaller pieces to make bite-size fried tamales. Serve fried tamales with aji amarillo or aji picante sauce. Remove the tamales from their wrappers, typically cornhusks or banana leaves. Leave them as is or mix the tamales all together to shape them into smaller appetizer-size tamales for frying. Shaping the leftover tamales into balls works best when they are very cold. Shape the mixed tamales into bite-size balls about the size of a golf ball. Beat the egg in a small bowl with a teaspoon of water until well-mixed. In a large shallow bowl, whisk together the flour, masa harina, cumin, garlic salt, pepper, and parsley or cilantro. Dip each tamale or bite-size ball into the egg mixture, letting the excess drain off, and then into the flour mixture. Repeat with remaining tamales or tamale balls. Heat 1 to 2 inches of vegetable oil in a heavy pot with tall sides over medium-high heat to 360 F.
Fry the tamales or tamale balls, in batches if necessary, until they are deep golden brown. Place them on a plate covered with paper towels to cool and sprinkle them with coarse salt. Serve warm with a dipping sauce. Fried tamales can stand alone as a tasty lunch or snack or as an appetizer. But you can also serve them for dinner with complementary sides. Here are some ideas. Tamales, fried or not, go especially well with beer. Any kind will do, but the best pairings are Vienna lagers, pale ales, amber ales or stouts. And of course, you can't go wrong with margaritas, mojitos or that great South American classic drink, a pisco sour.